In 2017 alone, approximately 5.5 million homes sold in the United States. For each house that sold, buyers and sellers had to reach an agreement on the final closing price. Though the initial asking price can influence how much you get when you sell your home, it’s rarely the exact price you get. For sellers, the easiest way to start getting homebuyers interested in their property is to set a fair asking price. To do this, you’ll need to have the house inspected for any wear and tear or extensive damage. But, there’s more to a home inspection than making the appointment. We’ve put together a simple home inspection checklist for sellers that will make the process as simple as possible. You know your house. If something looks off or needs repair, taking care of it before you list the property will improve the chances of it selling. Take a walk around the inside of your house and look for visible signs of damage. These include discoloration on the walls from water leaks, cracks in plaster, loose tiles, and even malfunctioning light fixtures. Then, head outside and check your siding for warpage. Look at the roof and see if any shingles are missing and pay attention to your landscaping. If you notice anything out of place, you can fix it before the home inspection or at least be prepared for what the inspector tells you in their report. Home inspections are thorough. This means they’ll go through every room, inspect every light fixture, and check every door frame for signs of damage. For some homeowners, the process can feel invasive. Make sure you’re prepared for the day by removing any valuable or fragile items from the property. Though inspectors are always cautious, accidents can happen. And you’ll want those items removed for any open houses in the future anyway. Once this is done, take the time to declutter your home. The easier it is for inspectors to access different spaces and identify damage, the faster the seller home inspection will be. Best of all, this will make prepping for open houses and home tours far easier. If you purchased appliances or had any maintenance work done on the property, make sure you have those receipts on hand. Think of these documents as proof that you’ve taken care of the property. Before the inspection, start searching for those documents. If you can’t find warranty information for an appliance, contact the manufacturer. They can look the item up by its serial number and give you the appropriate information. If you purchased a protection plan from the store selling the appliances, make sure you have that information as well. The more documentation you have, the easier it will be to value the home accurately. Staying at the home during an inspection is allowed, but it’s not always the best idea. It’s easy for homeowners to get nervous when someone is walking through the house, looking for even the smallest issues. And for some, it’s best to leave the house during the inspection. Go out for coffee, take care of errands, or go for a long walk. This will give the inspector time to go through the house while sparing you the stress of watching them pick the structure apart. Home inspectors need access to the entire house. And they can’t move around freely if your dog or cat is underfoot. If you have pets, you need to keep them away from the house during the inspection. This will make the inspection easier for the inspector and less stressful for your pets. The home inspector is ultimately a stranger and having unfamiliar people wandering the home is often stressful for dogs and cats alike. Take your pets with you or drop them off at a daycare facility near your home. You can also board them overnight at your vet’s office if the daycare hours won’t work with your schedule. If you don’t use a door or gate frequently, it’s easy to forget to unlock it before the inspection. But if the inspector can’t access the entire property, they won’t be able to complete the inspection. Before they arrive, walk through the house and make sure all doors are unlocked. This includes access to crawlspaces, attics, and basements. Then, walk around the exterior and make sure all outside doors and gates are unlocked. While it’s not the end of the world if you forget to unlock a door, it can slow the process down. The faster the inspection is finished, the sooner you can start making necessary repairs to sell your house for the highest price. After the inspection, take the time to go through the report with your real estate agent. They know which repair issues can be deal breakers for prospective buyers and which ones won’t impact your asking price much. If you need to fix anything, take care of it before the first open house. The last thing you want any prospective buyers to see is visible damage. Taking care of those repairs will make your home more appealing and increase interest in the property. 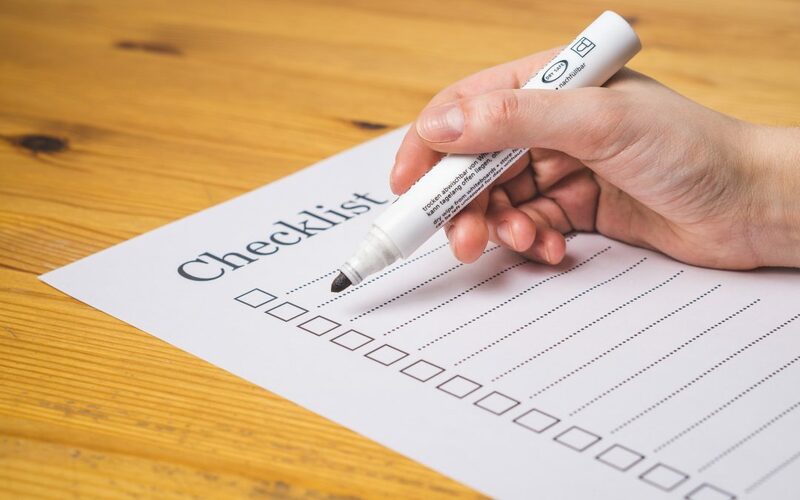 This home inspection checklist for sellers is a great place to start when preparing your house for a home inspection. But the most important tip we can leave you with is to schedule the inspection in the first place. Knowing as much as you can about the condition of your property will help you prioritize repairs and get the most for your home. At Class Home Inspection, we’ll take the time to go through your property as thoroughly as possible. You’ll know exactly what needs to be fixed so you can sell your home quickly.